This article will explore the GE Oven Model JGB700SEJSS and how it compares to other ovens in its class and price range. We will also explore some of its pros and cons. This oven is the perfect choice for anyone who enjoys cooking without having to spend over $1000 while still creating high-quality dishes. 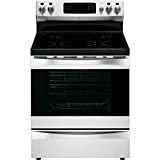 What Does The GE Model JGB700SEJSS Oven Cost? 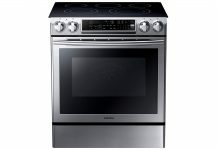 The GE Model JGB700SEJSS Oven is a freestanding gas convection range that allows for both stove-top and oven cooking. 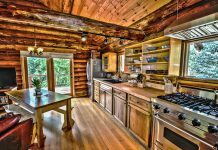 For stove-top cooking, there is plenty of space to allow for multiple pots and pans at once. The oven uses heat circulation to guarantee even results when baking and broiling. The heavy-cast grates clean safely and easily in the dishwasher allowing for cleanup with less effort and time. This product boasts a five-burner gas range and one of the industry's largest integrated, non-stick central griddle burners that allows for perfect preparation of classics like grilled cheese sandwiches and pancakes. The precise simmer burner allows for consistent heat for the preparation of delicate foods and sauces without the fear of burning or uneven cooking. A major benefit of this oven for users is its self-cleaning function. The steam-clean option allows for ease of cleanup without a lengthy or strenuous process. This oven is reasonably priced at around $700. You can purchase this product from multiple outlets including but not limited to: Amazon, Sears, Lowes, Home Depot, and Best Buy. We gave this product a rating of 4 stars out of 5. The self-clean option makes cleanup easy and quick. You also have increased control over the burners and heat level which decreases the likelihood of burnt or overcooked food. You will also really enjoy the griddle function and the fact it is nonstick as it offers another quick and easy way to cleanup after cooking. We gave the features of this oven a rating of 5 stars out of 5. 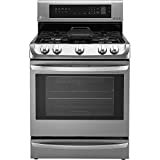 The self-cleaning function, non-stick griddle, dishwasher safe heavy-cast grates, and 18,000 BTU Power Boil burner combined with a powerful circulating convection oven make this product an excellent value for the cost. The oven itself is rather large at 5 cubic feet allowing for multiple dishes to be prepared at once, which makes it ideal for large, holiday meals. Compared to the ease of use and features of the GE Model JGB700SEJSS Oven, the design quality is less positively reported based on user experience. Customer reviews indicate this product suffers from issues with the tempered glass, warped drawers that do not properly align, and faulty door hinges. Based on these factors we rate the design quality as 3 out of 5 stars. The warranty offered for this oven is standard for the industry with 1 year limited parts and labor. We gave a 4 out of 5 stars rating due to reviews by users indicating they had to employ service repair more than once during the warranty period. 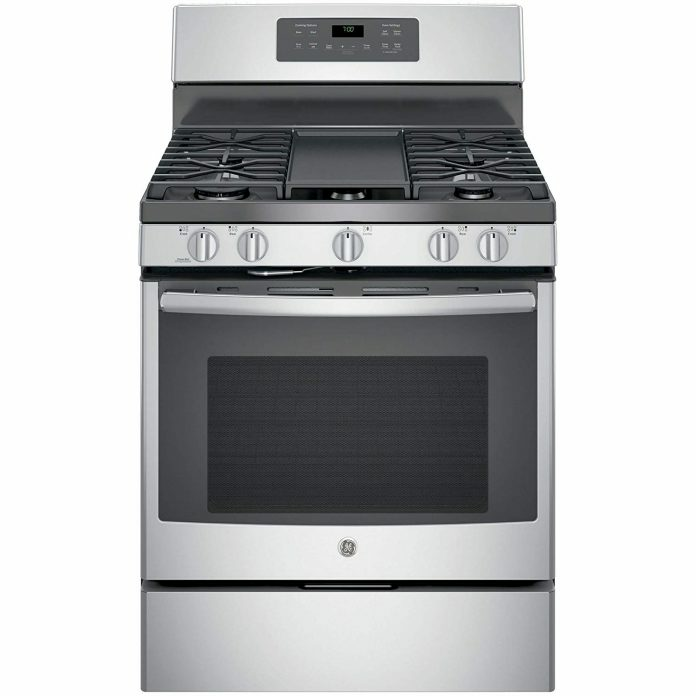 The LG LRG4115ST Stainless Steel Gas Range is a high efficiency electric stove and oven that highlights many advanced features. Like the GE Model JGB700SEJSS Oven, this product has an easy clean function that ensures quick clean up. The oven features a unique and stylish blue interior that includes a light for keeping an eye on your meals while cooking without opening the door causing temperature disruption. The oven contains three racks and a storage drawer beneath for containing pots and pans to save room. We rated the ease of use 4 stars out of 5 due to the easy clean function that lends to a quicker and more hassle-free experience during cleanup. The electric Smoothtop, however, is easily soiled when preparing meals and can require added effort to remove debris once stuck. One of the most desired features of this product is the true convection oven with multiple cooking modes such as warm or proof-ideal for proofing bread and pizza doughs. The oven also has a door lock function to maintain safety. The Intuitouch keypad allows for advanced temperature and oven function control. We gave the product 4 stars out of 5 for its features due to the higher cost compared to features offered. 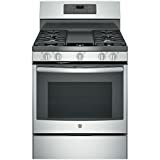 We found the LG LRE3083ST 30" Stainless Steel Electic Smoothtop Range to be 5 out of 5 stars. The Smoothtop range is sleek in its design and has a warming element to advise when a burner is still hot after it is no longer in use which increases safety for all in the household. The oven is large at 6.3 cubic feet with three interior racks to allow for preparation of multiple dishes. Users can also look forward to a storage drawer for easy access to pots and pans when cooking. We gave 5 out of 5 stars as this oven has an industry standard 1 year limited parts and labor warranty with many users reporting minimal to no issues with the product's performance. This product is unique in the way it uses induction cooking as opposed to traditional electric or gas methods. This technique transfers energy to the cooking pot through magnetic induction, which allows far more rapid changes in temperature. It also offers a variable self-clean feature that allows you to choose your desired cleaning time ranging from 2 to 4 hours. The induction range boasts pan size detection sensors which tailor energy output to fit pots and pans of varying shape and size, so even and consistent cooking is a guarantee no matter what the size of your cooking vessel. We rated the ease of use 5 stars out of 5 because this product will do much of the work for you! The variable self-clean feature gives you the power to dictate how long the oven cleans itself and the Power Boost feature temporarily hikes induction output to pots, skillets and pans, helping deliver a quick increase in temperature to crisp sandwiches, melt cheeses and deliver a speedy and perfectly prepared meal. These features allow for cooking tailored to your needs while ensuring you don't have to put forth additional effort. The features offered ranging from the advanced induction cooking to multiple methods of temperature control make this an innovative design. The oven space is larger than some at 6.1 cubic feet with an extra-large door window with halogen interior light so you can always keep an eye on your culinary creations. This oven also features a lock-out feature to ensure safety at all times. The True Convection technology combines a robust fan with a hidden heating element to surround your dish with equal heat, helping bake and brown everything you prepare flawlessly. The innovative features combined with user reviews led us to give the features a rating of 5 out of 5 stars. We gave the design quality of this product 4 stars out of 5 due to its sleek and modern design using induction heating technology but possibly dangerous warming drawer. The potentially confusing feature at the bottom of the oven is for warming foods-not for storage of pots and pans. Some users have caught oven mitts or towels on fire while using the cleaning function of the oven as no flammable products are to be stored in that space and the location and design of the drawer can be misleading. We gave the warranty offered 5 stars out of 5 due to its slightly longer than industry standard limited warranty of 13 months with limited customer negative reviews. When using this product one can expect efficiency and flexibility. The center 9,500 BTU burner is perfect for griddles and large pots while the 5,000 BTU simmer burner is perfect for low boils, melting butter, and keeping soups warm without scalding or burning. You can also count on 2 and 5-hour self-cleaning cycles in the oven to make sure clean up is a breeze and only consumes as much energy as needed depending on how dirty the unit is. We gave a review of 4 out of 5 stars based on the easy-to-use touch button controls and twist knobs that give you increased control. A helpful feature is the bottom warming drawer that lets you keep finished foods warm and a temperature probe to help you roast meats perfectly without having to open the door. You can also easily remove grates and burner caps for a full wipe-down when spills occur. This range is designed with a 5.8 cubic feet capacity giving plenty of room for large trays or baking dishes and three adjustable racks. We found only 3 stars out of 5 as the features available compared to the high listing price seems disproportionate. While the Dual Power Burner gives you more control to simmer or sear; the rest of the features included are in many other products that are less expensive. 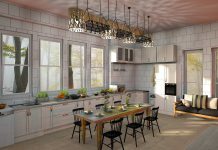 The oven space is smaller than some but has a removable stove-top griddle and custom wok grate which you may find attractive based on what type of foods you prepare. We rated this 5 stars out of 5 due to how sturdy and durable the design of this product is. The slide-in range is reliable and provides consistent heat to even the largest pots and pans. The oven heats quickly and maintains even heating through the True Convection technology. Users hardly have to repair or replace parts making the design quality top notch. We gave a 5 stars out of 5 review due to the adherence to industry standard 1 year limited parts and labor warranty. Few users have to call upon that warranty due to the strong design quality. 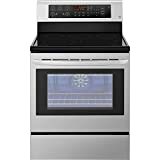 We give the GE Oven Model JGB700SEJSS 4 stars out of 5 after performing the side-by-side comparison with similar products. While it lacks the higher design quality and innovative induction heating elements of more expensive alternatives, it is an incredible value. You still get the self-cleaning feature for easy cleanup, a huge non-stick central griddle burner, and the joy of cooking on gas for those who prefer it. Other advanced features such as the 18,000 BTU Power Boil Burner only add to the product's value. This really is the ideal product for those who want an efficient and versatile product that performs for the busy holiday season without spending over $1000. GE company produces best quality of products and they never fails to innovate them from time to time. JGB700SEJSS Is GE's best oven machine which is very affordable and durable, it also has a large stove top with non-stick central griddle burners that allows for perfect preparation of classics like grilled cheese sandwiches and pancakes. However, this oven has lack of interior light so its hard to see what's happening inside your oven.